Nowadays, more and more computers are using SSD, some computer users upgrade their HDD to SSD, which brings the question should we defrag an SSD? Traditional spinning hard drives have a metric known as Access Time (or Seek Time, which is a slightly different measurement) that refers to the average amount of time it takes for the drive armature to physically reposition the heads so that they can begin reading data from a given sector of the disk (it may be more or less depending on how far the heads have to travel). It should be noted that this latency is measured in milliseconds (thosandths of a second) and is incurred every single time the heads have to be repositioned. The whole purpose of defragmentation is to arrange the files in such a way as to make them more or less sequential, so that the heads do not have to be repositioned as much in order to read a file. SSD's do not have heads that need to be moved, nor do they have spinning latency. As a result, the access time for every cell in the matrix is equal, and is measured in nanoseconds (billionths of a second). Even if a file is very heavily fragmented, the increased latency to read it is imperceptibly small. Defragging will not improve performance to a noticeable degree. Also unlike traditional spinning hard drives, the individual cells in an SSD have a limited number of write cycles before they "wear out". SSDs employ a wear-leveling algorithm to spread out writes to extend the life of the drive. Relocating the same data to a different area of the flash cells waste those write cycles. In this case, defragging can actually reduce the lifespan of the drive. So now our concern is what shall we do to increase the lifespan of SSD. Below are the 5 most basic and effective ways to improve SSD’s lifespan. 1. Disable prefetch parameters to increase SSD working life. 2. Disable Superfetch parameters to increase working life of SSD. 3. Disable defrag system drive on boot to increase working life of SSD. 4. Disable auto defrag when idle to increase working life of SSD. 5. Enable TRIM function to improve working performance of SSD. These tweaks may sound a little bit hard for normal users. No biggie, you can make all these setting modifications with one single click. I am not bluffing. Just download Wise Care 365, you can see System Optimizer feature in System Tuneup section. 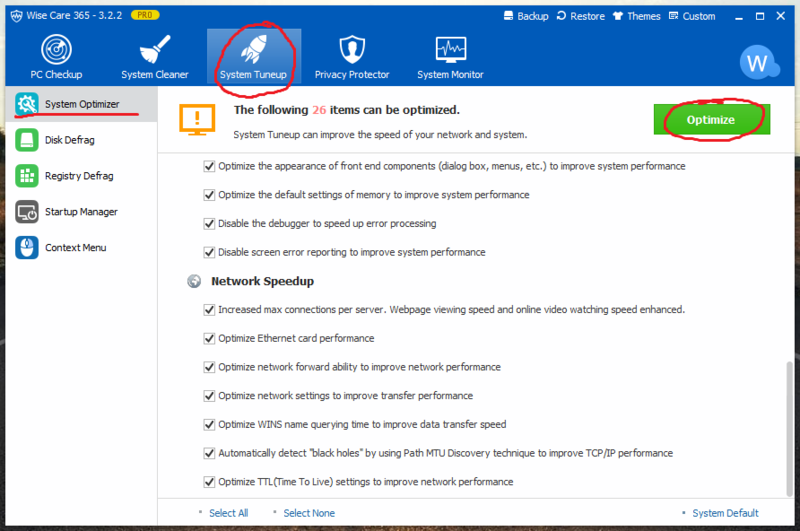 If there is an SSD in your computer, there will be an item called SSD Optimization right below Network Speedup( Unfortunately my computer does not have one, so this item is not shown here). Single click ‘Optimize’, Wise Care 365 will make all the 5 changes I mentioned above along with other optimizing tweaks.